Interesting weather we’re having. Sometimes it’s cold sometimes it’s colder and sometimes it’s warm enough outside to go out and play! It’s important to have activities planned with the weather in mind. 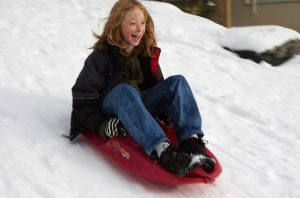 There is just something special about sledding on some fresh snow. If it’s too cold outside, play some music inside and have some fun dancing around with the little ones. We have more ideas in store for you and a delicious grapefruit juice smoothie recipe in the January Fit Families Newsletter.